How many precious metals investors know the year the United States imported a record amount of silver? This figure is so great, there is no other single year in U.S. history that comes anywhere close to this amount. Even more impressive than that, it turns out to be more than double the global annual mine supply that year. It is such an unbelievable amount, its record has never been surpassed to this day. Actually, I was quite surprised by the data when I was researching through some old official records. Even though the United States currently imports a lot of silver to supply its growing jewelry, industrial and investment demand, it pales in comparison to the nearly half a billion ounces imported this record year. For example, U.S. silver imports are estimated to reach 6,100 metric tons (mt) in 2016, or 196 million oz (Moz), up from 191 Moz in 2015. 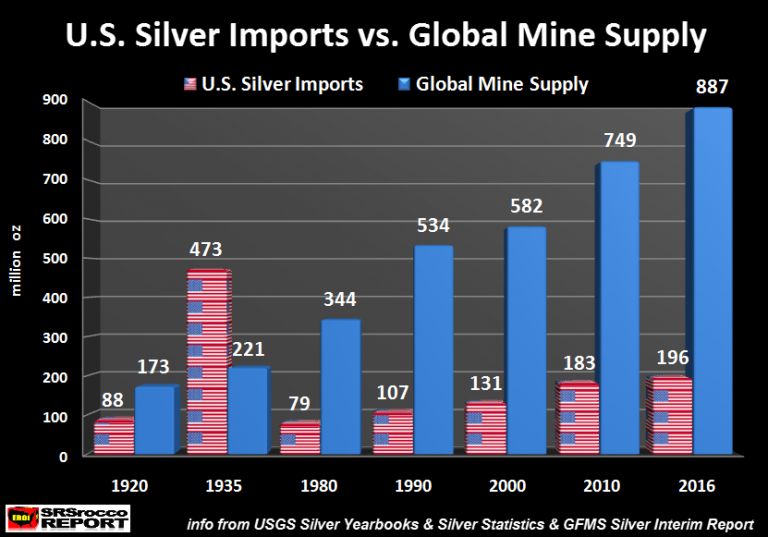 Thus, 196 Moz of U.S. silver imports last year accounted for 22% of global mine supply which is estimated to be 887 Moz. 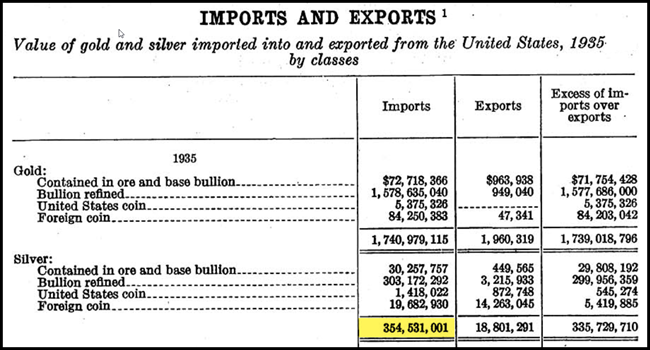 As we can see, total U.S. silver imports in 1935 stick out like a sore thumb. Even though U.S. silver imports trended higher from 1980 to 2016, there was this huge anomaly in 1935. So, what gives? Well, due to the U.S. Silver Purchase Act of 1934, the U.S. Treasury went on a massive buying spree by jacking up the price of silver to $0.77 in 1935 from $0.44 in 1934. 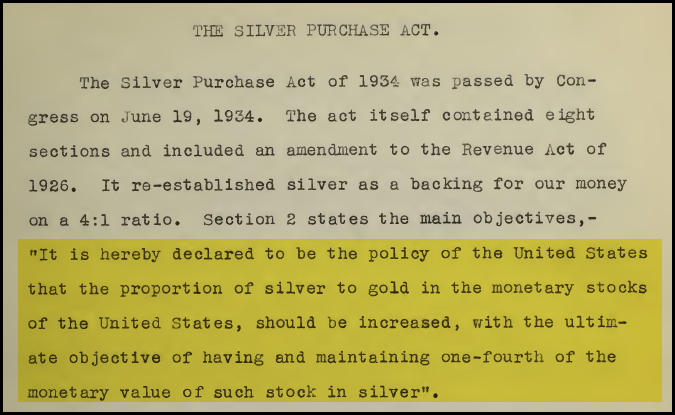 There is a lot that can be written about the U.S. 1934 Silver Purchase Act, but the motivation by the U.S. Government was to acquire more silver to back their outstanding currency base. In order to increase the proportion of silver monetary stocks to gold, the U.S. had to get its hands on a lot of silver. In this paper, it stated that the U.S. Treasury would have to purchase 1,244,000,000 oz of silver to arrive at this 4:1 Gold-Silver monetary stock ratio. In 1935, the United States imported a total of $354.5 million worth of silver. It is hard to tell exactly what was the average price the U.S. Treasury paid for all of its silver imports that year, but if we apply the $0.77 stated price, the $354.5 million worth of silver imports equals approximately 460 Moz… very close to the 473 Moz stated figure in the first chart published by the USGS silver statistics. In order for the U.S. Treasury to build up its silver stocks, it pushed up the price it would pay for silver to acquire the metal from various countries throughout the world. Because of this large increase in the silver price by the U.S. Treasury, it forced the Chinese to go off their silver standard. 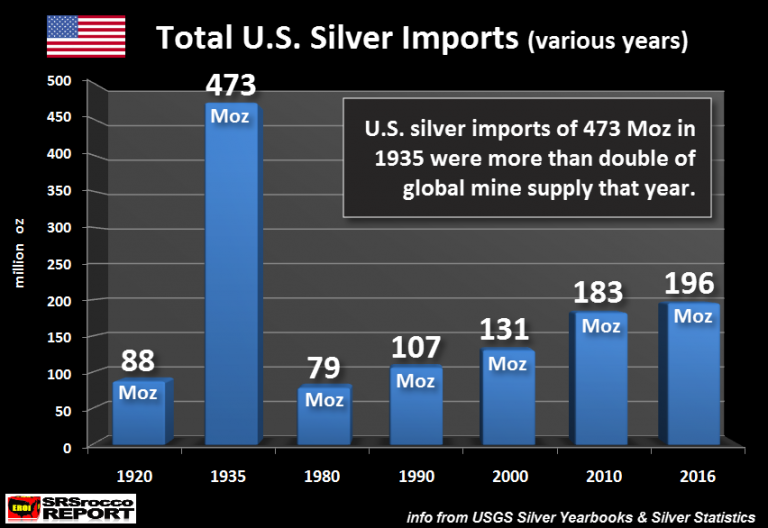 Thus, U.S. silver imports of 473 Moz in 1935, were more than double the global mine supply of 221 Moz. Which means, the U.S. Treasury realized it would take a great deal of time to purchase the 1.24 billion oz of silver unless it motivated the rest of the world to let go of some of their silver. By pushing the price of silver from $0.44 in 1934 to $0.77 in 1935, the U.S. was able to import nearly 40% of their 1.24 billion oz target in just one year. There has been articles written by several analysts (Charles Savoie for example) that state the U.S. Silver Purchase Act of 1934 was instrumental in removing the silver standard in several countries like China and Mexico. While this may be true, the United States was becoming the power-house of the world due to its massive oil discoveries. We must remember, the U.S. was the Saudi Arabia of the world during World War II. Regardless, the 473 Moz of silver the U.S. imported in 1935 was the largest amount ever. Even though U.S. silver imports were quite high in 1936 at 222 Moz, they were less than half of the previous year. Lastly, many precious metals investors believe the Chinese have a massive hoard of silver. Honestly, I do not belong to that mindset. While the Chinese did have a lot of silver at one time, they sold quite a lot of it during the 1930’s and also more in the 2000’s. Very few Central banks hold any silver. Most of the silver today is held in private hands or by large institutions… not Central Banks. The advent of modern technology also forced the United States to remove silver from its coinage in 1965. However, times are rapidly a-changing. In the future, the value of silver will not be based on how much is consumed by industry, jewelry or investment demand, but rather how it functions as a HIGH QUALITY STORE of VALUE compared to most other assets that will be disintegrating as the massive amount of debt and derivatives implodes.